Is this corruption and lawlessness rooted in the absence of adequate law enforcement, or the lack of independent judges? Or is it a national culture of corruption that ranks such nations among the most corrupt in the world on Transparency International surveys? 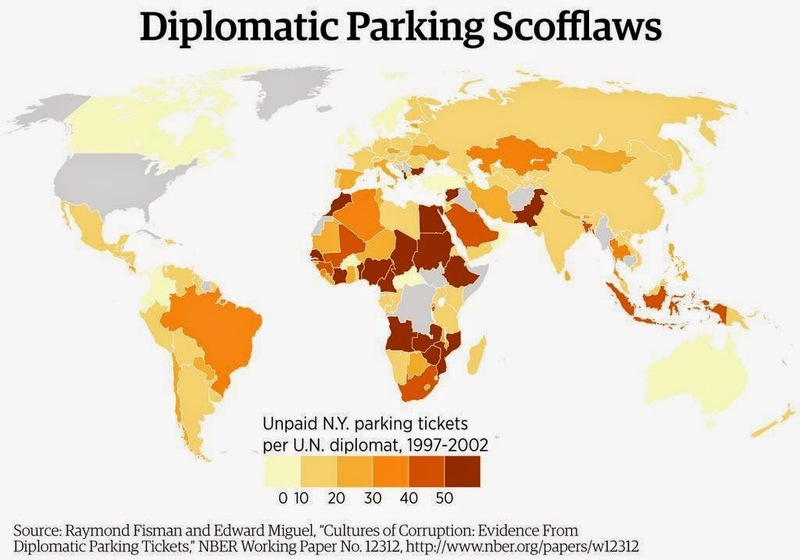 A paper titled "Cultures of Corruption: Evidence from Diplomatic Parking Tickets" by Ray Fisman of Columbia University and Edward Miguel of University of California, Berkeley attempts to answer the above question by using parking violations data on international diplomats living in New York City during 1997-2005. Since all foreign diplomats have immunity from prosecution in the host country, they do not have to pay fines for any parking violations in New York City. The authors argue that the way the diplomats from different nations behave in such a situation is entirely based on the cultural norms of the nations they represent. The data presented by the authors shows that Pakistani diplomats with 69.4 tickets per diplomat are the tenth worst offenders, behind those from Kuwait (246.2), Egypt (139.6), Chad (124.3), Sudan (119.1), Bulgaria (117.5), Mozambique (110.7), Albania (84.5), Angola (81.7) and Senegal (79.2). The authors also report that diplomats from low corruption countries (e.g., Norway and Sweden with zero parking citations) behave remarkably well even in situations where they can get away with violations, suggesting that they bring the social norms or corruption “culture” of their home country with them to New York City. Others with no parking violations include diplomats from Oman, Turkey and UAE. In addition to a strong correlation between number of parking tickets and TI's corruption index, Fisman and Miguel also find that officials from countries that have less favorable popular views of the United States commit significantly more parking violations, providing nonlaboratory evidence on the role that sentiment and affinity play in economic decision-making. With 69.4 tickets for each official ranking them at number 10, Pakistani diplomats in New York are also the worst among fellow South Asian diplomats. Bangladeshi diplomats rank 28 (33 tickets), Sri Lanka ranked 40 (17.2 tickets), Nepal ranked 43 (16.5 tickets) and India ranks 79 (6.1 violations per diplomat). Going by the highly persuasive data and arguments by Fisman and Miguel, it is hard to see how better law-enforcement and independent judiciary can solve the highly corrosive problem of widespread corruption in Pakistani society, unless it is also accompanied by a national campaign to promote a culture of honesty in the country. Such an effort must begin with open acknowledgment of the seriousness of the corruption crisis and an earnest desire to change, followed by wide-ranging ethics reforms in all spheres of life which are actively role-modeled and led by civil, social, political, business, military and religious leaders of the country. I think there is a bias against Pakistan in Western Media. Pakistan is better than India in reality. "My feeling is that it was all a hoax, a drama which has been crafted, and badly scripted I would say. "But they shouldn't make a scapegoat of Pakistan in this way. This is very wrong." - Hamid Gul. He said this on TV. OBL was killed in Afghanistan and brought to Abbotabad to make the very good Military and Pakistan look bad. I was in Pakistan recently and people are worried that foreign forces like RAW of India and CIA in America are working together to destroy our nuclear weapons by supporting Pakistan Taliban. This corruption business is all their agenda because there is corruption even in America. Corruption in India is worst just like their poverty as you can see in your video. Pakistani people still keep working hard inshallah. Denial is not the right answer. Unless Pakistanis acknowledge the existence of serious problems of corruption, incompetence and terrorism in their midst, there can be no progress toward solutions. The sooner it is done, the better it is for average Pakistanis who are suffering the most from the current multiple crises. Corruption is also rampant in the US, both within the military and the politicians. It will be good if you shoot them down as well. Best if you tabulate PK v. US along those lines. "I think there is a bias against Pakistan in Western Media. Pakistan is better than India in reality." If Pakistan focuses on itself or had focused on itself it would not be in this predicament today. If I can paraphrase Golda Meier 'Pakistan loves itself but hates India even more'. The only genuine cohesive force in Pakistan that keeps it going is the universal dislike and hatred of India. All other problems including CORRUPTION is secondary! corruption is one reason that lead us to this situation that we are bing declared as a failed state. people who have authority are buty in collecting more and more wealth with the net of corruption and those who are still clean are either waiting for the opportunity or been dumb enough to utilize it. thats the reality, bitter tough. Imagine if you had to pay a bribe to see your newborn baby, get your water supply connected or obtain your driving licence. It's an everyday fact of life in India - but campaigners are now fighting back, using people power and the internet. "Uncover the market price of corruption," proclaims the banner on the homepage of ipaidabribe.com. It invites people to share their experiences of bribery, what a bribe was for, where it took place and how much was involved. Launched in August, the site gives Indians a chance to vent their frustrations anonymously and shine a spotlight on the impact of corruption on everyday life. "I did the driving test correctly but still the official said I was driving too slow, I realised his intention so gave him 200 Rupees and got the thing done," is a typical example of a posting. The website was the brainwave of Ramesh and Swati Ramanathan, founders of a not-for-profit organisation in Bangalore called Janaagraha which literally means "people power". "Bribery is routinely expected in interactions with government officials", Swati Ramanathan told me, "to register your house, to get your driving licence, domestic water connection, even a death certificate." Having lived in the US and the UK for several years, they were dismayed on their return to see how widespread corruption had become and decided to do something about it. "We are all also responsible because we end up paying the darn bribes because otherwise you can never get anything done in India. "We said, 'It's not enough to moralise, we need to find out what exactly is this corruption? What's the size of it?'" The website has evolved into a consumer comparison site where people can also get information and advice in different languages on how to avoid paying bribes. One woman told me how she got round paying a bribe to register her mother's house. "What I had been told at the website is that this is one of the excuses they make to take a bribe, and what we need to do is tell them, 'OK, give it to me in writing with your stamp and seal, and I will make sure I get these documents the next time so that I can get it registered.'" "The moment I said that, they backed off and said, 'No, no, it's OK, we will pass it through.'" So far, nearly 10,000 bribe experiences have been reported across 347 cities and 19 government departments. As the numbers mount, Swati Ramanathan hopes the website will become a powerful tool for shaming government departments into tackling corruption. "There is so little risk to being corrupt in our country and so high a reward," she explained. Are sections of India's civil society subverting democracy to pressure the government to push through tough anti-corruption laws? The beleaguered Congress-party led government appears to think so. The senior-most minister Pranab Mukherjee has fired an uncharacteristic broadside at activist Anna Hazare's anti-graft agitation for resorting to hunger strikes, making unreasonable demands like video graphing meetings of a joint panel to discuss an ombudsman law and imposing deadlines on the parliament. Mr Hazare is a well meaning Gandhian, who has a record of fighting corruption in his home state of Maharashtra. But he also has a predilection for making clumsy statements - he endorses capital punishment for the corrupt, for example. But few Indians deny that Mr Hazare has touched a chord, mostly among the country's fretful, politician-loathing middle classes, by pressuring the government to take a tough stand against corruption. Graft has become a way of Indian life, kept alive by the rulers and ruled alike. Mr Mukherjee's barb is clearly not aimed at Mr Hazare alone. Last fortnight, Baba Ramdev, a thriving yoga guru with political ambitions, also began a hunger strike in Delhi demanding that the illicit money stashed away in foreign banks by rich Indians be brought back home. After futile negotiations with the guru, the government cracked down on his fast in the middle of the night, baton charged sleeping supporters and evicted him from Delhi. The police action earned the opprobrium of many Indians, and further battered the government's fast-eroding credibility. Now the government appears to be trying to bottle the genie of Mr Hazare and Baba Ramdev's "movements", both of which it legitimised in the first place through recognition and negotiation. It seems to be also unable to handle the vicissitudes of these agitations, with its leaders blowing hot and cold against the government. Such a civil society movement, Pranab Mukherjee said, amounts to a "sinister move of destroying the fine balance between the three organs of government enshrined in our constitution". "If someone dictates terms from outside to the government, does it not weaken or subvert democracy? It is a big question... We are all civil society, no one is uncivil." Clearly, Mr Mukherjee's definition of civil society in the haste of a press conference is literal. The World Bank defines civil society to "refer to a wide array of non-governmental and not-for-profit organisations that have a presence in public life, expressing the interests and values of their members or others, based on ethical, cultural, political, scientific, religious or philanthropic considerations". India has seen deeper, meaningful civil society movements which have been blithely ignored by most of middle class in the past. Only when a protest comes to Delhi in the full glare of 24/7 news television does it get attention. And more so, when it rallies against corruption - which actually hurts the poor more than the rich and the middle class. By all means, many believe, an enlarged and more representative civil society - ideally a larger, wider group of people from all over the country, not just a bunch of well meaning lawyers and activists from Delhi - should be putting pressure on a stubborn government to act against corruption. Also, as development expert Rajesh Tandon reminds us, civil society is not intrinsically virtuous. And good graft-free governance does not come from reforming the state alone - it demands the reformation of society and its people. There are no short cuts to a more virtuous India. Data from Pew research and Transparency International shows that the nations, such as India and Pakistan, where the huge majorities of people claim religion is important in daily lives are also among the most corrupt. Today I had a conversation with someone who told me he was in Karachi for 6 years. He was born and raised in Canada and went there for a job with Barclays. He does seem to have parents who were from Pakistan, however. He worked there and was involved in other banking industry orgs and also helped an NGO out. I asked him for his impressions about the local system and the present state of the country. He has just returned home to Canada a few weeks ago. He told me the system worked well and the mayor was a good mayor. He said he thought he did a very good job. He also said right now country is in a deep mess. People in power seem to just want to take what money they can out of the system. he said this happening at all levels! I would like you to be cognizant of the fact that now in Pakistan, corruption is at a scale that boggles the mind - at least it should boggle the mind. We are talking no longer millions but BILLIONS. We are talking about Pakistan's external debt shooting up by ten billion dollars in a short span of 3 years with nothing to show for it. I suspect the borrowed dollars have been purchased with corruption billions and transferred abroad. In the next 2 years huge repayments are maturing to the IMF and other lenders. The oil price may shoot up. Our exports reduce and our water supplies may stunt our agriculture. I don't see how we will be able to cope. Billions are 'spent' by the government and as much as 40-50% if not more is diverted for pay-offs. There is hardly any development or relief going on anywhere. debt service has gone through the roof, being the biggest item in the budget. Poverty is rising, employment growth is nonexistent. Spending on social services had collapsed as there is no fiscal space. Corruption is a HUGE component in both out fiscal and current account deficits. It has made a huge increase in both our domestic and international debt. it can corrupted the moral fiber of the country, especially the bureaucracy. Now the younger generation is actually embracing corruption as a perfectly acceptable way of life, looking at the leadership, the tycoons and the senior government officers as role models. They are actually openly defending the corruption of their families and expressing their intention to indulge in the same. However, this improvement is not due to the fact that the government or the rulers are less corrupt than they were before but because of some good results shown by institutions like the judiciary, Public Accounts Committee (PAC), federal tax ombudsman and the defence departments. Although last year’s 34th position of Pakistan was out of a total of 178 countries assessed by Transparency International as against 2011’s 42nd rank out of 183 countries, still the country did not deteriorate further as has been the case during the previous three years of the present regime. To be released here on Thursday, the Transparency International’s 2011 Corruption Perceptions Index evaluated Pakistan getting 2.5 score out of 10, and ranked as 42nd most corrupt country out of 183 countries. In 2010, TI report Pakistan’s score was 2.3, and it ranked 34th most corrupt country out 178 countries. In 2011, the rank of Pakistan has improved because of increase in the number of countries assessed this year. Pakistan gained new heights in corruption during the last three years under the present rulers. Pakistan ranked as the 47th most corrupt country in 2008, but in 2009 the country became more corrupt and ranked 42nd in 2009. In 2010, it was 34th most corrupt nation in the world. However, it is interesting to note that the Transparency International acknowledged that the arrest in the further decline of Pakistan in terms of corruption is not due to the present government’s efforts to curb the menace but owing to commendable role of the judiciary, the Public Accounts Committee, the defence establishment and the federal tax ombudsman. It underscored that PAC, which has done remarkable work under Leader of the Opposition Chaudhry Nisar Ali Khan, recovered Rs115 billion from 2008 to 2011. The TIP also applauded judiciary’s zero-tolerance for corruption, the Ministry of Defence efforts to apply long-standing Public Procurement Rules 2004 in the armed forces departments; and the working of the federal tax ombudsman as one of the cleanest institutions in the government. The TIP, however, said that this progress has been overshadowed by the ongoing corruption cases like the NICL, RPPs and 2010 Haj scandal in which the Supreme Court has affected recoveries of billions of rupees. 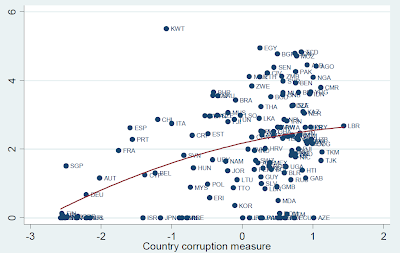 The TI report says that corruption continues to plague too many countries around the world. According to the Transparency International’s 2011 Corruption Perceptions Index, some governments failing to protect citizens from corruption be it abuse of public resources, bribery or secretive decision-making. Transparency International warned that protests around the world, often fuelled by corruption and economic instability, clearly show citizens feel their leaders and public institutions are neither transparent nor accountable enough. 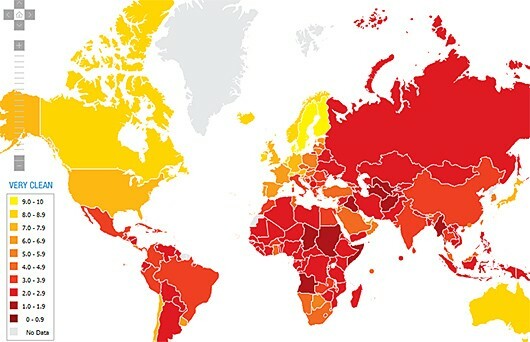 The 2011 index scores 183 countries and territories from 0 (highly corrupt) to 10 (very clean) based on perceived levels of public sector corruption. It uses data from 17 surveys that look at factors such as enforcement of anti-corruption laws, access to information and conflicts of interest. Two-thirds of ranked countries score less than five. New Zealand ranks first, followed by Finland and Denmark. Somalia and North Korea (included in the index for the first time) are last. Pakistan with 2.4 score ranked 42nd most corrupt country. KARACHI: Speakers at a symposium on Friday said that corruption has thrived in every institution of the country, while institutions established to curb this menace have failed to identify the magnitude of the burgeoning problem, a statement said. The National Reconciliation Ordinance (NRO) introduced corruption to the top levels of the national politics and government, it said. These views were expressed in a seminar organised by the National Accountability Bureau (NAB) on “good governance and curbing corruption”. The event was organised to mark world Anti-corruption Day that fell on December 9 every year. Dean Faculty of Law, Federal Urdu University, former justice Dr Muhammad Ghous said corruption invariably hampered the good governance, while institutions formed for keeping surveillance on such a practice have not yielded good results. In his view, honest, sincere and competent officers should be elevated at the helm of affairs of institutions to do away with corruption completely. He regretted that corruption had become a part of life of every individual in the country. Be it a bank, educational institution, research institution or any other public service organisation, all departments have become morally sick, he added. Dr Ghous said the most corrupt people are, unfortunately, irremovable from their services mainly due to the political influence. There is no global prescription for eliminating corruption, however, encouraging public participation and strengthening of institutions by giving authority to honest officers could significantly contribute in curbing this problem, he said. Transparency International Pakistan Adviser Adil Gillani said the UN Convention against anti-corruption was ratified by Pakistan in 2007, while just passing the 37 days of its ratification, the then president General Pervaiz Musharraf introduced NRO, hence, paving the way for corruption at every level of the government. Good governance could significantly play a vital role in eliminating corruption, he said. Sindh NAB Director General Major Shabbir Ahmed (Retd) said the cooperation of people is direly needed to do away with the burgeoning menace of corruption. The department is endeavoring to cope with this problem, he said. Ahmed said that imposition of strict rules and regulations in every organisation could play a vital role in anti-corruption mission. Former Inspector General Police Sindh, Niaz A Siddiqui regretted the non-existence of any mechanism to protect rights of citizens. He questioned why there is no surveillance of police officials in their offices, contrary to thousands of close-circuit cameras installed in the city monitoring citizens. He saw absence of strict accountability mechanism behind increasing corruption in the country. Judiciary has stepped up into the 4th position from 6th in the previous year in terms of corruption, while land administration department has got the first position on the list of country’s most corrupt institutions, according to the National Corruption Perception Survey 2011, released by the Transparency International Pakistan (TIP) on Wednesday. According to the report the police department has taken the second spot while the Power sector has dropped to the 5th rank from 2nd. Taxation slipped to the 3rd rank from its previous 8th position, while Customs and Tendering and Contracting departments have shown alarming increase in the corruption trend. It is pertinent to mention here that for the first time military has been included in the survey and it was the least corrupt department after education in the year 2011. Police had topped all the previous years’ surveys but the Land Administration has crossed them and the factor of the ‘Land Mafia’ was one of the big reasons for this increase. The annual survey report was released at Karachi Press Club in a press conference by TIP Chairman Sohail Muzaffar, along with TIP Advisory Committee chairman Syed Adil Gilani. This year’s survey has been conducted by Gallup Pakistan. Sohail Muzaffar cited the delay in punitive action by the state organs against the corrupt elements in corruption cases like Pakistan Steel, NICL, Punjab Bank, Rental Power Plants, KESC, PIA, Railway and Wapda as the main reason for the rise in corruption levels. Sohail informed that judiciary is confronted by deliberate defiance in implementing Supreme Court orders and delay in punishing corrupt persons by the judiciary is one of the causes of lower ranking of judiciary. He said that they have released the reports to tell the government and the people that which is the most corrupt department and it should not be taken into personal context or any political intention. “We are trying to help out the government by showing them the corrupt sections in them, now it’s up to the government how it cleans them”. On the inclusion of military in the survey, the TIP chairman said, “We have not included it in the survey, Gallup itself has added military and they have not put railways in the survey”. He said the military should not be placed before the education in the rank because according to him military is less corrupt than the education. He added that Gallup agreed late to conduct the survey, “No one was ready to conduct the survey, the Institute of Business Administration (IBA) which conducted the previous year’s survey refused to conduct it this year. We had short time and Gallup agreed in the last”, said Muzaffar. The latest perception report from Transparency International Pakistan (TIP) shows a limited number of respondents see centres of corruption in Pakistan in the following descending order, of being perceived as the most corrupt to the least: 1) land administration; 2) police; 3) income tax; 4) judiciary; 5) tendering & contracting; 6) customs, plus state corporations and the last is the army. Once again TIP has expressed its shock at the mounting lack of honesty in public affairs and has listed some of the reasons why the graph of evil is creeping upwards every year. It is not surprising that land administration is the first among the perceived culprits. It is vastly the domain of the provinces where the politician has yet to begin to take responsibility for sorting-out maintenance and collection. Land record is still in primitive shape and the low bureaucracy that handles the sector is not upgraded and made competitive. Most of the trouble takes place away from the big cities because the writ of the state languishes in smaller districts and abdicates to three power centres: the feudal landlord (often a politician), the police and the judiciary. It will take a long time to sort-out this mess and it will not happen at the same speed in all the provinces. The police has endemic ills that most states in the Third World have failed to tackle. The recruitment of policemen has been pegged to good education only recently, but the provinces — whose domain this is — have been remiss in making the kind of allocations needed to upgrade the institution’s performance. The ratio of policemen to population is abysmal, training standards — though imitative of the army — are nowhere near being practically useful and low status has kept the average policeman tied to slavish behaviour towards the seniors and a brutish one towards the common man. But the police may not be intrinsically as bad as the circumstances of its functioning make it. State policies favouring non-state actors involved in terrorism on the side have hamstrung the police. Unwillingness to prosecute has instilled in the department a habit of not trying too hard to convict, say, terrorists from a shady jihadi organisation simply because it is being clandestinely supported by the state. Because of this ambience of state-backed criminality, many policemen themselves indulge in crime and get away with it. Many senior policemen live beyond their means and own properties they could not have bought with honest money. As for the tax administration, if one were to look at the statistics, things may be getting better — and that is why it is no longer number one in corruption. Pakistan’s revenue collection is one of the lowest in the world (with the tax-collection machinery believed to be riddled with corruption and inefficiency) and that impacts directly the capacity of the state to spend on development. The reigning theory is to erect a system in which the income tax officer comes into least contact with the taxpayer. If Pakistan's chief justice, Iftikhar Chaudhry, manages to press his charges of corruption against the president, Asif Ali Zardari, he will bring down the existing Pakistani government. If he extends his anti-corruption campaign to the political elites as a whole, he will bring down the entire existing political system – and replace it, his critics say, with a dictatorship made up of an unelected (and equally corrupt) judiciary. The truth is that Pakistani politics revolves in large part around politicians' extraction of resources from the state by means of corruption, and their distribution to those politicians' followers through patronage. Radically changing this would mean gutting the existing Pakistani political system like a fish. Nor is it at all certain how popular the process would really be with most Pakistanis. For while the greater part of this process of extraction and redistribution is illegal according to Pakistani law, how much of it is immoral in Pakistani culture is a much more complicated question. Every Pakistani politician accuses his rivals of corruption but, equally, the perception that he himself is "generous" and "honourable" to his own supporters is likely to be central to his own local prestige. If a public monument is ever erected to the Ideal Pakistani Politician, the motto "He dunks but he splashes", originally coined by Mayor Richard Daley of Chicago, should be inscribed on its pedestal. And this is not just a matter of cynical politics. It also obeys a fundamental moral imperative of local culture to be loyal to one's followers and, above all, one's kinfolk. The politician who is really despised is the kleptocrat who both steals immoderately and does not share the proceeds. As a result, a good deal of the proceeds of corruption does get distributed through parts of society, thereby helping to maintain what until recently has been the surprising underlying stability of the Pakistani political system. The military is widely seen as relatively immune to corruption, and when it comes to its own internal workings, this is largely true – though it usually ceases to be true when generals go into politics. However, it is vitally important to note that this is in large part because for many decades the military as a whole has acted as a kind of giant patronage network, extracting a huge share of Pakistan's state resources via the defence budget and other concessions, and spending them on itself. Because – to its credit – it has distributed the resulting benefits in an orderly if hierarchical way among its generals, officers, non-commissioned officers and even to a degree privates, it has managed to keep a lid on corruption within the military itself. However, a belief is growing among ordinary soldiers, not just that the generals' perks are immoderate but that in some cases their families are using their connections to make huge corrupt fortunes outside the military. As for Zardari, it seems highly doubtful that he can hang on much longer. The chief justice is pursuing him with bulldog determination and the letter of the law is on his side. The military has been infuriated by what it believes are his attempts to ally with Washington against it. It does not want another military government, but it does want a civilian regime that is much more responsive to its wishes. And the opposition want him out before, not after, senate elections that might just enable him to cling to the presidency even if as expected his Pakistan People's party is defeated in general elections due by early 2013. Whether getting rid of Zardari will fundamentally change Pakistani politics, however, is a very different matter. "While Benazir Bhutto hated the generals for executing her father, Nawaz Sharif early on figured out that they held the real power in Pakistan. His father had established a foundry in 1939 and, together with six brothers, had struggled for years only to see their business nationalized by Ali Bhutto’s regime in 1972. This sealed decades of enmity between the Bhuttos and the Sharifs. Following the military coup and General Zia’s assumption of power, the business—Ittefaq—was returned to family hands in 1980. Nawaz Sharif became a director and cultivated relations with senior military officers. This led to his appointment as finance minister of Punjab and then election as chief minister of this most populous province in 1985. During the 1980s and early 1990s, given Sharif ’s political control of Punjab and eventual prime ministership of the country, Ittefaq Industries grew from its original single foundry into 30 businesses producing steel, sugar, paper, and textiles, with combined revenues of $400 million, making it one of the biggest private conglomerates in the nation. As in many other countries, when you control the political realm, you can get anything you want in the economic realm." (LAHORE, Pakistan) — Corruption is so pervasive in Pakistan that even Osama bin Laden had to pay a bribe to build his hideout in the northwest where he was killed by U.S. commandos. Ordinary Pakistanis complain they have to grease officials’ palms to get even the most basic things done: File a police report when they have a traffic accident. Obtain copies of court documents. Get permission to see their relatives in the hospital. Now, an enterprising group of Pakistani officials is cracking down on this culture of graft with an innovative program that harnesses technology to identify corruption hot spots in the country’s most populous province, Punjab. The initiative, which leverages the ubiquitous presence of cell phones, relies on the simple concept of asking citizens about their experience. The program — run by the Punjab Information Technology Board — uses telephone calls and text messages to get feedback from citizens conducting transactions with a dozen different government departments, including those dealing with property, health and emergency response. Bin Laden’s courier, who built the al-Qaida chief’s compound in the town of Abbottabad, had to pay roughly a $500 bribe to a patwari to purchase the required land, according to Pakistani intelligence officials, who spoke on condition of anonymity because they were not authorized to talk to the media. The low level of corruption reported could be partly driven by citizens’ reluctance to tell government officials the truth, said Michael Callen, an assistant professor of political science at the University of California, Los Angeles, who is conducting research on the program. That could improve as the program becomes more widely known, the anonymity of individuals is protected and more punitive action is taken against corrupt officials, he said. The initiative’s scale and proactive solicitation of feedback differentiate it from other anti-corruption efforts around the globe, such as the “I Paid a Bribe” website run by an Indian non-profit group. The website and other similar schemes rely on citizens to take the initiative to complain. That can produce fictional accusations made to blackmail honest officials, said Umar Saif, head of the Punjab technology board. The Punjab government already has used data from the program to pressure officials to clean up their operations. While the initiative does not attempt to tackle the millions of dollars thought to be involved in high-level government corruption, it faces significant challenges since much of Pakistan’s political system is based on patronage. Politicians hand out jobs to their supporters in exchange for votes. It’s not the salary or benefits, but the chance to solicit bribes that makes the jobs highly coveted. NEW DELHI — Generations of Indians have grown up imagining a bank with high ceilings and chandeliers in Switzerland, where shadowy Indians go to leave a lot of illicit cash in the care of practical white men. In popular lore, the “Swiss bank account” is an essential part of Indian villainy, even though illicit money is a common household possession. So, last week, when a news agency quoted a Swiss official as saying that Switzerland was willing to share with the Indian authorities information about Indians of dubious nature who hold bank accounts in that country, the Indian government appeared to give the news considerable importance. Considering the infamy of the Swiss bank account in the Indian imagination, data released last week by Switzerland’s central bank, the Swiss National Bank, contained a surprise. Indians, not all of them shady, held about $2.3 billion in Swiss banks last year. That’s 40 percent more than in 2012, but just a third of what they had parked in 2006. Indian accounts represented just 0.15 percent of the total holdings by foreigners in Swiss banks in 2013. When Indians talk about their country’s illicit money, which is chiefly tax-evaded funds and income by illegal means, there is, of course, righteous contempt. But there is also a swagger over the sheer size of this shadow economy, because, after all, it is Indian. So a mere $2.3 billion was not what most Indians would have expected their rich and corrupt to have stashed in their Swiss nests. It is possible that Indian money has fled to safer havens over the years, or has returned to India disguised as respectable investments. Nobody knows just how big India’s illicit economy is, but in recent years Indians have come to accept that it is very big. From the range of numbers that claim to measure the shadow economy, Indians tend to believe in the highest. A popular notion is that $1.4 trillion of illicit Indian money has flown out of the country over the decades and is held in various parts of the world. The apparent source of this figure is an analysis in 2009 by the academic R. Vaidyanathan. He had extrapolated it from a report released by Global Financial Integrity, a think tank in Washington; $1.4 trillion swiftly became a widely accepted estimate of Indian illicit money held abroad. Mr. Kar’s report hit India at a time when the middle class was convinced that it was disgusted by corruption. The $500 billion figure was picked up by politicians, reformers and officials, who quoted each other to support their claim. A study published in 2006 by Friedrich Schneider on the world’s shadow economies dealt briefly with the “tax morality” of Germans. According to the study, two-thirds of the Germans surveyed regarded tax evasion as a “trivial offence,” while only one-third judged stealing a newspaper this way. Indian tax morality is similar, but it makes a distinction between expatriate illicit money, which is viewed as a serious crime perpetrated by the very corrupt, and money held within India, which is perceived as a practical measure. Black money, as illicit money is called in India, is a significant part of Indian life. Most Indians of means, including many who protested on the streets against political corruption, deal in illicit money when they buy or sell real estate, or when they need foreign exchange to import goods. Huge amounts of cash travel across India during election seasons to bribe voters. Rich ladies prowl Delhi’s malls with bricks of cash in their bags, or with attendants who carry the bricks for them. And, there is a network of quaint people much in demand for their ability to magically transmute rupees collected anywhere in India into dollars that can be made to appear almost anywhere else in the world. Pakistan’s National Accountability Bureau (NAB) has reportedly submitted a list of 150 mega corruption cases, involving high-profile figures such as, Prime Minister Nawaz Sharif, his brother and Punjab Chief Minister Shahbaz Sharif, former premiers, ministers and top bureaucrats, before the country’s Supreme Court. The report said that an inquiry was being carried out against the incumbent prime minister and his brother in a case pertaining to the construction of a road from Raiwind to Sharif family House worth Pakistani rupees 126 million, reported the Dawn. Former Prime Minister Raja Pervaiz Ashraf is also being scrutinised for the rental power plants (RPP) case. Also, a case has been launched against former President Asif Ali Zardari for possessing assets beyond resources. It also mentioned 50 cases of monitory irregularities, misuse of powers and land scams. Among the monitory irregularities, inquiries were being conducted in 22 cases, with probes launched into 13 cases and references in 15 cases. In land scams, on the other hand, 29 cases were under inquiry, 13 cases were being investigated and references had been filed in eight cases. The report also showed that inquiries were underway in 20 cases of abuse of power, while a probe had been launched into 15 cases and references filed in 15 cases. The case, which was filed by Manzoor Ahmed Ghauri earlier this year against NAB chairman and other officials, is being heard by a three-member bench headed by Justice Jawwad S. Khawaja. The report was submitted after the court expressed disappointment over what they claimed was an extreme form of ‘maladministration’ in the anti-corruption body. The hidden wealth of some of the world’s most prominent leaders, politicians and celebrities has been revealed by an unprecedented leak of millions of documents that show the myriad ways in which the rich can exploit secretive offshore tax regimes. The Guardian, working with global partners, will set out details from the first tranche of what are being called “the Panama Papers”. Journalists from more than 80 countries have been reviewing 11.5m files leaked from the database of Mossack Fonseca, the world’s fourth biggest offshore law firm. Though there is nothing unlawful about using offshore companies, the files raise fundamental questions about the ethics of such tax havens – and the revelations are likely to provoke urgent calls for reforms of a system that critics say is arcane and open to abuse. A $2bn trail leads all the way to Vladimir Putin. The Russian president’s best friend – a cellist called Sergei Roldugin - is at the centre of a scheme in which money from Russian state banks is hidden offshore. Some of it ends up in a ski resort where in 2013 Putin’s daughter Katerina got married. Six members of the House of Lords, three former Conservative MPs and dozens of donors to UK political parties have had offshore assets. The (Panama Papers) data contains secret offshore companies linked to the families and associates of Egypt's former President Hosni Mubarak, Libya's former leader Muammar Gaddafi and Syria's President Bashar al-Assad as well. The documents reveal many Israeli connections and disclose people with Israeli citizenship as well as Israeli banks and entities have used the offshore law firm to register companies in tax havens around the world, Haaretz reported. Several Israeli banks appear in the files, Haaretz said. Bank Hapoalim managed some of its trusteeship activities for trust funds through the law firm. This activity, carried out by means of the subsidiary Poalim Trust Services, closed down in 2011. The documents also contains many correspondences concerning Bank Leumi activity in Jersey in the Channel Islands. At least 33 people and companies in the documents had been blacklisted by the US for wrongdoing, such as some Iranian interests and those of Lebanon's Hezbollah, the ICIJ said. One of the companies exposed in the leaked documents provided fuel for aircraft used by the Syrian government to bomb and kill thousands of its citizens, Haaretz said. "These findings show how deeply ingrained harmful practices and criminality are in the offshore world," said Gabriel Zucman, an economist at the US-based University of California, Berkeley, and author of the book The Hidden Wealth of Nations: The Scourge of Tax Havens. Zucman, who participated in the ICIJ investigation, said that the publication of the leaked documents should encourage governments to impose “concrete sanctions” on countries where such firms are registered and on institutions that provide confidentiality for companies using tax havens, Haaretz said. The leaked data from 1975 to the end of last year provides what the ICIJ described as a "never-before-seen view inside the offshore world." The investigation yielded the millions of documents from about 214,000 offshore entities, the ICIJ said. The source of the documents, Mossack Fonseca, is a Panama-based law firm with offices in more than 35 countries. It is the world’s fourth-biggest offshore law firm, the Guardian said. Though most of the alleged dealings are said by the ICIJ to be legal, they are likely to have serious political impact on many of those identified. Close associates of Putin, who is not himself named in the documents, "secretly shuffled as much as $2bn through banks and shadow companies," the ICIJ said. The files identified offshore companies linked to the family of Chinese President Xi Jinping, who has led a tough anti-corruption campaign in his country, the ICIJ said. In Iceland, the files allegedly show Prime Minister Sigmundur David Gunnlaugsson and his wife secretly owned an offshore firm holding millions of dollars in Icelandic bank bonds during the country's financial crisis. The leaked documents were reviewed by a team of more than 370 reporters from over 70 countries, according to the ICIJ. The BBC cited Mossack Fonseca as saying it had operated "beyond reproach" for 40 years and had never been charged with any criminal wrongdoing. Haaretz, however, reported that authorities in the British Virgin Islands fined Mossack Fonseca $37,500 for violating laws against money laundering - it had registered a company in the name of former Egyptian President Hosni Mubarak’s son, but did not report its relationship to the two even after both father and son were charged with corruption in their country. It was not immediately clear who was the original source of the leaked documents. The children of Pakistan’s prime minister, Nawaz Sharif, raised a £7m loan from Deutsche Bank against four flats in Park Lane in London owned by offshore companies. Acquired while Sharif was in opposition, the properties were owned by British Virgin Islands shelf companies on the books of the offshore agent Mossack Fonseca, the Panama Papers show. The Sharif family’s investment in upmarket London property was disclosed in 1998 by Rehman Malik, a political opponent and the head of Pakistan’s Federal Investigation Agency, who had fled to London after allegedly being arrested and tortured. Malik compiled a report that he claimed showed the Mayfair homes had been bought using “ill-gotten wealth earned through corrupt practices”. He claimed they had not been declared on tax returns, in breach of Pakistani law. Sharif and members of his family have always denied any wrongdoing, and none have ever been convicted of any offence. Supporters say the charges against them are politically motivated. It is not illegal to own property through an offshore company. Yesterday the family responded to the furore in Pakistan with a statement saying the Panama Papers “have made no allegations of wrongdoing against the Sharif family”, and that “all of the corporations owned by the Sharif family are legal and financially sound”. In October 2008, Nawaz Sharif’s son Hussain and daughter, Mariam, turned to the Swiss arm of Deutsche Bank to borrow large sums, using the flats as collateral. Three BVI companies were used to raise the loan, which entitled Nawaz Sharif’s adult children to borrow £3.5m in cash and a further £3.5m in money to be invested in “liquid assets” by Deutsche Bank. Deutsche began auditing its private banking clients in 2013, seeking confirmation that they complied with all relevant tax rules. Checks on its Swiss and Luxembourg clients are now understood to be complete. The flats in question are at Avenfield House overlooking Park Lane, where Sharif was once photographed at a press conference with his political rival Benazir Bhutto. They are held by two BVI entities on the books of Mossack Fonseca, Nielsen Enterprises and Nescoll Limited. In his confessional statement, dated April 29, 2016, Uzair testified that he joined a gang led by Abdul Rehman alias Rehman Dakait in 2003 and was incarcerated in the Central Jail, Karachi where he was appointed incharge of the prisoners belonging to the Pakistan Peoples Party (PPP) on the recommendation of then jail superintendent Nusrat Mangan and PPP leader Faisal Raza Abedi. In the statement available with The Express Tribune, Uzair disclosed that he assumed full-fledged command of the gang after Dakait was killed in an encounter in 2008 and formed an ‘armed terrorist’ group under the name of the Peoples Aman Committee (PAC) and became its chairperson. He confessed to have collected Rs20 million extortion from different persons and departments every month, adding that the fisheries department would pay Rs2 million. He also disclosed that PPP MNA Faryal Talpur, sister of party co-chairperson Asif Ali Zardari, was given Rs10 million extortion every month. According to the alleged gangster, Dr Saeed Baloch and Nisar Morai were posted to the fisheries department on his recommendation. “I maintained a friendly relationship with the [then] Karachi Capital City Police Officer Waseem Ahmed, SSP Farooq Awan and his brother Shahadat Awan [a lawyer and currently posted as prosecutor general of Sindh],” Uzair disclosed, adding he had done several favours for them, including helping Farooq and Shahadat encroach land in Malir. He also got Farooq to collect Rs150,000 to Rs200,000 in extortion every month. The incarcerated gangster disclosed that on the insistence of Senator Yousuf Baloch he met the then chief minister Qaim Ali Shah and Talpur and asked them to get the head money and cases against him withdrawn, which was eventually done by Talpur and Zardari. In his statement, Uzair disclosed that after the Karachi operation was intensified he was called through Qadir Patel and Senator Yousuf by Talpur to her Defence residence, where Sharjeel Inam Memon and Morai were also present. According to him, Talpur discussed various issues the including Lyari gang war, and offered to hide his personal arms and explosives and have Sharjeel and Morai handle his financial affairs and Yousuf and Patel handle affairs in Lyari if he wanted to flee the country. He testified to have done various illegal works for the party, including helping Patel encroach land and providing 500 jobs to criminals on Yousuf’s insistence. He also admitted to have helped Owais Muzaffar Tapi, Zardari’s foster brother, illegally occupy 14 sugar mills that were later purchased at lower prices. Uzair also claimed to have sent 20 of his men to harass residents around Bilawal House on Zardari’s instructions and force them to sell 30 to 40 bungalows to Zardari at lower prices. The gangster said he came to know about a plan to kill him while in police custody, so he pleaded to have his custody transferred to the Rangers. The former Lyari kingpin had also requested complete protection, apprehending that he and his family members could be killed after these revelations, as he expected revenge from Zardari and other politicians he named in his statement.